For a scientist who claims to be only interested in science and not in advocacy, he certainly sounds like a fervent Global Warming Enthusiast. Here is the feedback I sent to the Bureau. I was interested to listen to your interview on Sunday Profile on ABC Radio yesterday, 29 March 2015. I was particularly interested in your comments regarding public criticism of the Bureau’s adjustments to temperature data, and on the increasing frequency in heatwaves. Several times you stated that the adjustments “make no difference at all” to temperature trends, that the raw temperature data “tell exactly the same story”, and that we see “the same result (in temperature trends) for the whole continent” as for raw data. Q.1: Can you please supply me with a reference to your data that show that the number one cause of death is heatwave? I was sure it was cardio-pulmonary disease usually associated with very cold weather, with mortality rates much higher in winter than summer. Perhaps you meant heatwaves are the number one cause of death when compared with other natural disasters, which is debatable. This was not at all clear and must surely have misled some listeners. For the next question I refer you to Table 1 on page 14 of On the sensitivity of Australian temperature trends and variability to analysis methods and observation networks (CAWCR Technical Report No. 050), R.J.B. Fawcett, B.C. Trewin, K. Braganza, R.J Smalley, B. Jovanovic and D.A. Jones , March 2012 (hereafter CTR-050). This shows that quadratic change in mean annual temperatures from 1911 to 2010 in adjusted data of the ACORN-SAT network (+0.94C) is 36% greater than in the ‘unadjusted’ data of the AWAP network (+0.69C). For maxima, the change is 38.9%, and for minima is 34.1%. In this paper the authors claim that the rise in unadjusted data is “somewhat smaller” than in ACORN-SAT. Q.3: In what way can 38.9%, 36%, or 34.1% difference in quadratic change be interpreted as “no difference”, “exactly the same story”, or “the same result”? Perhaps you should have told your listeners that the similarity was only since 1955, and that before this, raw data show temperatures (especially maxima) were cooling, but then 60 years is not such a long climate record for making trend analyses, and this may be confusing to those who cannot understand more than a simple climate narrative. In the Concluding Remarks of CTR-050, p.50, the authors state that “further work will be undertaken to characterise in more detail these changes, particularly at the monthly and seasonal level”. Q.4: When can we expect to see the results of this further work published on the ACORN-SAT website? If it is available elsewhere please refer me to it. 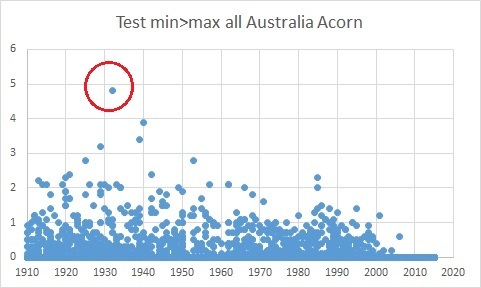 I am particularly interested in any difference in quadratic change in summer maxima between AWAP and ACORN-SAT, as this is relevant to heatwave analysis. For an explanation for my interest in comparison with AWAP data, see my analysis of monthly and seasonal differences in trends between AWAP and Acorn from October last year. My calculations indicate a 200% increase in trend in summer maxima. One might think that if Australia wide there has been a five-fold increase in the number of very serious heatwaves, there should also be some discernible increase in the number of very hot days. The linear trend (for what it’s worth) shows an increase of 0.02 days per decade. That’s 0.2 of a day per hundred years, or 2 days in 1,000 years. Scarey hey. I will be following up on the hot days and heatwaves analysis in coming posts. The first meeting of the Clayton’s Review Panel was held yesterday. The press release about the proceedings is here. “The Technical Advisory Forum held its first meeting today to advise on part of Australia’s official climate record – the Australian Climate Observations Reference Network Surface Air Temperature (ACORN-SAT) data set. Today’s discussions were robust and productive, and the Forum would like to thank the Department of the Environment for managing the Forum’s membership and assisting the Chair. The Forum would also like to thank the Bureau of Meteorology for providing information and answering questions on the ACORN-SAT data set. The Technical Advisory Forum was appointed by the Parliamentary Secretary to the Minister for the Environment, the Hon Bob Baldwin MP as an independent advisory body to provide greater transparency and an impartial framework for quality assurance tests and analysis of the Bureau’s data sets. In line with its Terms of Reference, the Forum discussed three aspects of ACORN-SAT: the extent of the public availability of the ACORN-SAT information; developments since the 2011 Independent Peer Review of the Bureau’s data and analysis methods; and the scientific integrity and robustness of the Australian climate record and the homogenisation process. The Forum considered a broad range of information and data concerning the management and development of the ACORN-SAT data set provided by the Bureau. The Forum also received some additional information from members of the public about the data set. Members of the Technical Advisory Forum were appointed to provide advice on the basis of their formal expertise, and the Terms of Reference do not therefore require the Forum to receive public submissions. However, this additional information was provided to all Forum members to ensure that Forum members were aware of public concerns regarding the Bureau’s management of ACORN-SAT during their deliberations. How Hot Is Brisbane? With new, ‘improved’, daily benchmarks! Recently I briefly posted about Brisbane, using 29.5 C as the heatwave bench mark. Silly me- after checking Dr Perkins’ site (Scorcher) I now understand that Dr Perkins was not calculating a single bench mark temperature for a heatwave. She calculates benchmark temperatures for every single day of the year. Temperatures in the top 10% for each date for three days in a row constitute a heatwave- including in winter. Thus Brisbane can have a heatwave in mid-July if the temperature is over 22.4 degrees for three days. Some heatwave! A real scorcher! Only one winter ‘heatwave’ has ever been over 30 degrees (33.7 C in 2009). However, silly as it sounds for winters, I decided to attempt to replicate Dr Perkins’ heatwave findings for Brisbane. For the years 1961 to 1990, I sorted each month’s days from hottest to coldest, and found the value for the top 10 percent of each month. I then used this value for each month, and calculated a centred 31 day running mean to give a benchmark value for each day of the year. This value is used to flag days hot enough, and if there are three or more in a row, there’s your ‘heatwave’. Rough and ready, and probably a very different method to Dr Perkins’, but values for heatwave benchmarks should be similar- if anything, a little low. Results are graphed below. Fig.1: Seasonal count of heatwave days, showing that yes, the number of heatwave days has increased. So yes, by this definition it is correct to say in spring Brisbane has slightly more heatwaves, which have more heatwave days, are slightly longer, and very slightly warmer, if you trust linear trends as an analysis tool for such non-linear data- (without the linear trend line and equation, it is difficult to see any trend in heatwave days, duration, or temperature). However, the results for other seasons are also revealing. Winter, summer, and spring all have slightly more and warmer heatwave days (summer heatwaves are 0.2 degree warmer after 65 years, winter ‘heatwaves’ will be half a degree warmer in 900 years! ), but autumn is declining in all areas- length, temperature, and number. Funny that Dr Perkins didn’t mention Brisbane autumns. And the most important thing about Brisbane heatwaves is not included in Dr Perkins definition- humidity. ACORN updated, but not improved. Result: the same bogus data. Early this month the ACORN-SAT dataset was updated to 31 December 2014. A quick check shows that despite much public criticism, nothing has changed since March 2012 when it was first released. There have been no corrections. There are still thousands of days of missing data. There are still gross errors. Adjustments remain, and so still have the effect of making many individual sites LESS comparable with neighbours, and of making national trends much greater than those for raw data. However, in this post I am merely focussing on one of the many erroneous features in Acorn, that of the instances of minimum temperatures exceeding maximum temperatures. Why bring this up again, as it was first spotted in 2012? Because it is more evidence of unjustified adjustments, and Acorn’s authors have done nothing about it. 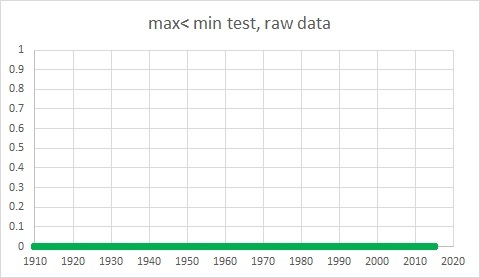 Although a specific check for errors in recording raw maxima and minima was conducted before homogenising, this check could not have been done with the homogenised data. It might be claimed that this feature is normal and due to a cold change arriving after 9.00 a.m. This would be especially evident in winter at high altitudes such as at Cabramurra, with 212 occurrences. If so, it would have been evident in the raw data. 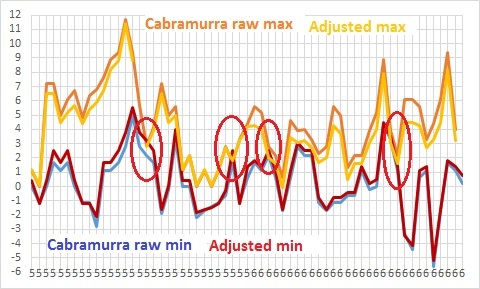 However, a check of 22 of the sites, comprising 84% of the instances (803 of 954) reveals there are NO instances of maximum less than minimum in the raw data for Cabramurra, or anywhere else. All instances occur in the adjusted data. Further, despite the Bureau being aware of the problem since at least 1 July 2013 when Blair Trewin, lead author of ACORN, assured readers of the blog Open Mind (sic) at https://tamino.wordpress.com/2013/06/29/a-clue-for-willis/#more-6693 that “in the next version of the data set (later this year), in cases where the adjusted max < adjusted min, we’ll set both the max and min equal to the mean of the two” (which merely hides the fault caused by adjustments), the problem still exists- 212 occurrences are still in the ACORN record for Cabramurra, and there are 954 in total. Trewin has done nothing about it- mainly because he would have to redo the whole dataset to do it properly. The problem exists because adjustments have been too vigorous and too erratic. The algorithm produces bogus data. Merely averaging maxima and minima on those 954 days hides the underlying problem. Here is one example, the worst I have found, (circled in Fig. 1), from Alice Springs, 15 June 1932. 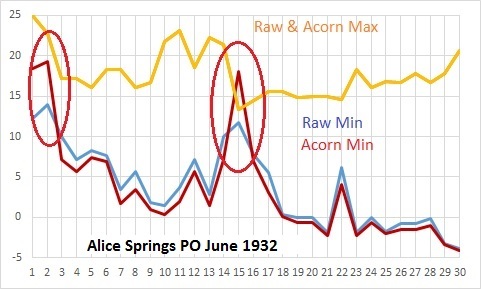 Notice there are NO adjustments in Acorn to raw maxima, but Acorn minima mostly runs along one or two degrees less than raw- except on 1 and 2 June and most notably on 15 June, when Acorn minima shoots to 4.8 degrees above the maxima for the day! This is caused by an adjustment of 6.4 degrees to the raw temperature. The Bureau lists the following sites as neighbours used for this adjustment: Boulia, Tibooburra, and Tennant Creek. Ignore for the moment that these are all hundreds of kilometres from The Alice, just visually compare their data. 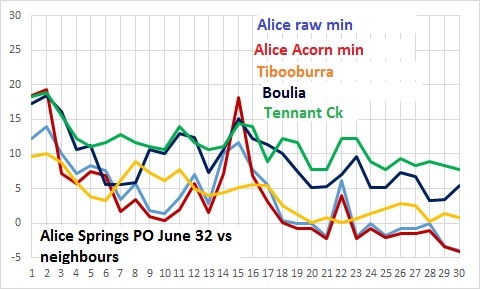 Tennant Creek and Boulia, hundreds of kilometres north and northeast, are usually several degrees warmer than The Alice, except when Acorn makes those huge adjustments. Which is the outlier? This Alice Springs instance is a rogue adjustment due to a leading “1” being inserted; 18.1 entered instead of 8.1. This is not uncommon in Acorn and crops up repeatedly. While this is annoying and farcical, it can be easily explained and easily fixed. The real problem is with data that is not so grossly erroneous, such as at Cabramurra. 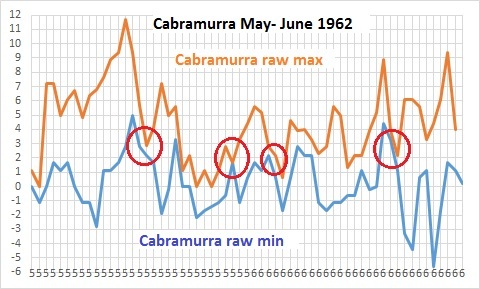 This graph shows raw minima and maxima for May and June 1962. Note that often maximum is not much above minimum: there is little room for error. But see what happens with adjustments. Maxima have been adjusted down, minima up, without any thought for the consequences, so four times in May and June 1962 minima exceed maxima. Merely averaging maxima and minima for those days will hide the symptom of the underlying disease. The adjustments cannot be justified because they result in nonsense data. Exactly how do you explain negative Diurnal Temperature Range? The problem of a tiny percentage of the record featuring this error is not minor: it indicates that many adjustments are too great, and also that no quality assurance checks have been performed, and therefore many other types of errors are likely to exist. And they do. Now how is it that my laptop can find these errors, whereas the Bureau’s supercomputer can’t? Here is a plot of their occurrence- the big lump after 1960 is due to Cabramurra. I am shocked, horrified, and angry after reading the Terms of Reference and Format of the Technical Advisory Forum. The proposal that this august body can investigate the many flaws in ACORN-SAT in a one day sitting once a year is beyond ridicule, beyond parody. It is sillier than the funniest episodes of “Yes, Minister”. It is apparent that it has been set up not to investigate but to verify the Bureau’s claims. It is a political solution to a perceived embarrassment. It has been set up to appease the Bureau’s critics by seeming to examine their concerns without actually doing so, and without upsetting the Bureau or the ALP or Greens. It will be a whitewash. The Technical Advisory Forum needs real teeth. It should be able to call witnesses, examine documents and analyse data. Instead it will listen to platitudes from the Bureau in the morning and have a discussion in the afternoon. What a joke! Meanwhile, ACORN-SAT has been updated to include data to 31 December 2014. It has not been improved. It still has thousands of days of missing data, 954 days when minimum temperature exceeds maximum, still has gross and obvious errors anyone can recognise, still over-adjusts raw data so that ‘homogenised’ data is LESS comparable with neighbouring sites, and still results in Australia wide trends that are much greater than those shown by raw data. I assume that you have acted on advice from your department. You have been hoodwinked. And unless you swiftly act to rewrite the Terms of Reference and Format for the Technical Advisory Forum to give it some real investigative power, this will be added to the list of bad decisions of a gutless government, more concerned about the opinions of the ABC, the press gallery, and the cross benches than its once loyal and hopeful supporters. Yesterday I posted about the ABC’s short term memory about heat at Longreach. Today it’s Boulia’s turn, this time due to a News Limited article, “Relentless, endless summer. The Queensland town where it’s been 40 degrees pretty much forever”. Using the ACORN dataset and current data for Boulia up to 2 March, here is a 180 day running count of days above 40 degrees in Boulia. (This captures days in one summer, but not two). Fig. 1: 180 day running count of days above 40 C at Boulia. Even with 43 missing days of data in December and January, this summer is not unusual. The next graph shows the length of 40+ heatwaves. Fig. 2: Consecutive days above 40 C at Boulia. This is definitely NOT the longest ever heatwave. This one is very mild- 31 days in 1973 is going to be hard to beat. Note that there is NO TREND in the length of heatwaves. Finally, this graph shows the number of days above 45 degrees, which is hot in anyone’s language. The missing data may have had some 45+ days, but there were many days with rain in this period. Fig. 3: 180 day running count of days above 45 C at Boulia. It’s hot in Boulia, but not unusually so. Tomorrow I will look at the latest claims about Australia getting hotter and cities getting more heatwaves. Today on ABC Radio’s Country Hour, there was an interview by Lydia Burton with a grazier from the Longreach district in Central Western Queensland, which has been having some pretty hot weather this summer, as has most of Western Queensland. Peter Whip is from Royston near Longreach and says over the last 50 years he has noticed an increase in the amount of days over 35 degrees and that is a real concern for all landholders. “In the last couple of years we have had some really long hot dry spells when the feed quality has been terrible and we have seen cattle conditions slip really quickly. The gist of the segment was that cattle were struggling in the heat, with so many days above 35 degrees Celsius, and especially with days over 40 degrees, let alone 45 degrees. As I have said before, I have close links to agriculture. My parents, grandparents, and great-grandparents were farmers; one brother still farms, another is retired, and my brother-in-law is a farmer also. As well, several nephews and nieces are on the land or in agri-business. I have great sympathy for those on the land at all times, especially in drought conditions. However, is there any evidence that Longreach is having an unusually hot spell, or that Longreach is getting hotter, or that it will get hotter in the future? And how could an intrepid rural reporter check the facts against one grazier’s anecdote? The very simplest check would be on Longreach’s mean maximum temperatures. From November to February, the mean monthly maximum is never below 35 C, so we might expect many days to be well above 35 C. Longreach Aero’s highest ever maximum was back on 28 January, 1990, at 47.3 C.
Let’s have a look at the number of days above 35 C, 40 C, and 45 C. I’ll do this for 180 day periods, which will capture days in a single summer, but not two. 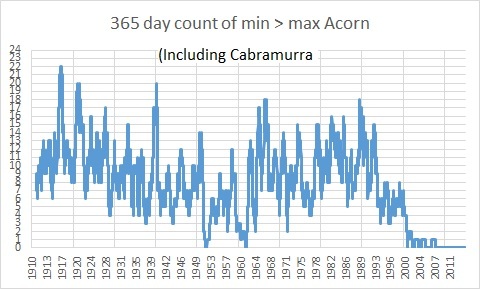 I use the official ACORN dataset, plus daily data right up to yesterday, 1st March, straight from the Bureau of Meteorology, so there can be no accusation of cherry picking or of using “unreliable” raw data. Fig. 1: Number of days in summer above 35 C at Longreach. And for the last 50 years…. Fig. 2: Number of days in summer above 35 C at Longreach since the summer of 1964 -65. What about the length of heatwaves? The next plot shows the number of days in a row where the temperature has exceeded 35 C.
Fig. 3: Number of consecutive days above 35 C at Longreach. Mr Whip may be a little mistaken. Since 1965, and since 1910, there appears to be no trend in the number of days above 35 C in Longreach, and there is no trend in the length of heatwaves. But the ABC is always talking about extremes- what about days over 40 C? Fig. 4: Number of days in summer above 40 C at Longreach. Fig. 5: Number of days in summer above 45 C at Longreach. Now Lydia Burton is a good rural reporter, I frequently listen to her on the Country Hour and the Rural Report, but if only she had checked the facts, she could have saved her listeners a lot of angst. Instead, “our” ABC continues to peddle nonsense about dangerous climate change. It’s no wonder that people have lost faith in the ABC. You are currently browsing the kenskingdom blog archives for March, 2015.